The total number of species represented – 1113, genera represented – 442, families represented – 197. 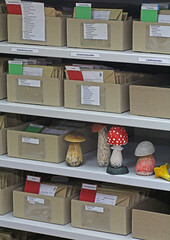 The majority of the specimens in the YSU Fungarium belong to the Basidiomycota (about 82%), less to Ascomycota (13%) with few specimens of Zygomycota and Myxomycota. The largest classes are the Agaricomycetes (4508 specimens), Leotiomycetes (327 specimens), and Pezizomycetes (196 specimens); the other 11 classes are represented by less then 70 specimens. 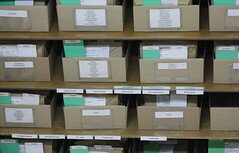 A total of 41 orders are represented , with Agaricales (3638 specimen), Russulales (427 specimen), Helotiales (272 specimen), pezizales (196 specimen) and Boletales (173 specimen) constituting about 90% of the collection. The Fungarium of the YSU represents 122 families, of which 15% and 11% belong to the families Cortinariaceae and Strophariaceae, respectively. They are followed by the Mycenaceae (7%), Tricholomataceae (6%), Russulaceae (7%), Pluteaceae, Agaricaceae, Inocybaceae, Omphalotaceae (each with 3%) with the rest of families representing less than 2%. Acremonium – 1; Acrospermum – 3; Agaricus – 17; Agrocybe – 29; Alborticha – 1; Albotricha – 1; Alloclavaria – 1; Allophylaria – 5; Alternaria – 1; Amanita – 80; Ampulloclitocybe – 12; Amylostereum – 1; Antennularia – 1; Antrodia – 4; Antrodiella – 3; Aphanobasidium – 1; Apiospora – 1; Arcyria – 2; Armillaria – 13; Arrhenia – 63; Arthopyrenia – 1; Arthrinium – 1; Artomyces – 7; Ascobolus – 2; Ascocoryne – 10; Asterodon – 2; Asterophora – 4; Athelia – 4; Auriscalpium – 5; Badhamia – 2; Baeospora – 3; Belonidium – 1; Beltrania – 1; Bisporella – 1; Bolbitius – 4; Boletus – 14; Botryosphaeria – 2; Botryotinia – 1; Botrytis – 7; Bovista – 10; Brunnipila – 1; Bryoria – 1; Calicium – 1; Calloria – 1; Calocera – 7; Calocybe – 1; Caloscypha – 2; Calvatia – 2; Calycellina – 5; Calyptella – 1; Cantharellula – 5; Cantharellus – 3; Capitotricha – 1; Cenangium – 1; Cenococcum – 2; Ceraceomyces – 3; Ceratiomyxa – 2; Cerioporus – 1; Ceriporiopsis – 2; Chaenotheca – 1; Chalara – 3; Chalciporus – 6; Cheilymenia – 2; Chlorencoelia – 1; Chlorociboria – 2; Chroogomphus – 11; Chrysomphalina – 1; Chrysomyxa – 1; Ciboria – 11; Ciliolarina – 1; Cistella – 5; Cladosporium – 17; Clavaria – 8; Clavariadelphus – 5; Clavulina – 1; Clavulinopsis – 6; Clitocybe – 87; Clitocybula – 1; Clitopilus – 3; Coccomyces – 5; Coleosporium – 1; Collybia – 16; Colpoma – 5; Coltricia – 3; Coniophora – 3; Conocybe – 39; Conohypha – 1; Conoplea – 1; Coprinellus – 10; Coprinopsis – 5; Coprinus – 7; Cordyceps – 6; Coronellaria – 5; Cortinarius – 835; Craterellus – 2; Crepidotus – 20; Cribraria – 2; Crocicreas – 4; Crustoderma – 1; Cryptosporium – 1; Cudonia – 8; Cuphophyllus – 2; Cyathicula – 5; Cyathus – 2; Cystoderma – 31; Cystodermella – 22; Cystolepiota – 3; Cytosporella – 1; Dacrymyces – 21; Dactylospora – 1; Daedaleopsis – 5; Daldinia – 1; Dasyscyphella – 3; Dasyscyphus – 1; Delicatula – 1; Dendrocollybia – 1; Dendrodochium – 1; Dendrophoma – 1; Dendryphion – 1; Dennisiodiscus – 1; Diderma – 1; Discinella – 4; Dothistroma – 1; Dumontinia – 1; Durella – 1; Elaphomyces – 1; Endogone – 3; Entoloma – 141; Epicoccum – 1; Eriopezia – 1; Erynia – 1; Erythricium – 1; Evernia – 3; Exidia – 6; Exobasidium – 4; Flammulaster – 22; Flammulina – 14; Fomitiporia – 1; Fomitopsis – 3; Fuligo – 7; Fuscolachnum – 4; Galerella – 1; Galerina – 190; Gamundia – 3; Ganoderma – 7; Gelasinospora – 1; Geniculosporium – 1; Geoglossum – 2; Geopyxis – 1; Gibbera – 5; Gloeophyllum – 2; Gloeoporus – 1; Gloiocephala – 1; Gnomoniella – 1; Gnomoniopsis – 4; Godronia – 7; Gomphidius – 14; Gomphus – 3; Gorgoniceps – 3; Gymnopilus – 32; Gymnopus – 130; Gymnosporangium – 1; Gyromitra – 40; Hamatocanthoscypha – 3; Hapalopilus – 2; Haploporus – 2; Hebeloma – 64; Helicoon – 3; Helminthosphaeria – 1; Helotium – 2; Helvella – 17; Hemimycena – 22; Hemipholiota – 1; Hericium – 13; Heterobasidion – 1; Hohenbuehelia – 5; Humaria – 5; Hyalopeziza – 6; Hyaloscypha – 19; Hydnellum – 5; Hydnum – 9; Hygrocybe – 19; Hygrophorus – 23; Hymenochaete – 3; Hymenoscyphus – 9; Hyphoderma – 2; Hyphodiscus – 1; Hyphodontia – 5; Hypholoma – 110; Hypochnicium – 4; Hypocrea – 2; Hypoderma – 2; Hypogymnia – 2; Hypomyces – 7; Hypsizygus – 7; Hysteronaevia – 4; Hysteropezizella – 2; Infundibulicybe – 15; Inocybe – 127; Inonotus – 6; Ionomidotis – 3; Ischnoderma – 1; Jaapia – 2; Kirschteiniothelia – 1; Kriegeriella – 2; Kuehneromyces – 35; Laccaria – 42; Lachnellula – 1; Lachnum – 16; Lacrymaria – 4; Lactarius – 133; Laetiporus – 3; Lamproderma – 1; Lasiobolus – 2; Lasiosphaeria – 5; Laxitextum – 1; Leccinum – 57; Lentaria – 1; Lentinellus – 14; Lentinus – 7; Lenzites – 1; Leotia – 5; Lepiota – 21; Lepista – 4; Leptosphaeria – 8; Leptostroma – 3; Leucocortinarius – 3; Leucovibrissea – 1; Libertella – 1; Lichenomphalia – 15; Limacella – 4; Lophodermium – 15; Lycogala – 1; Lycoperdon – 73; Lyophyllum – 3; Macrocystidia – 1; Macrotyphula – 10; Marasmiellus – 1; Marasmius – 23; Megacollybia – 10; Melanoleuca – 19; Melanospora – 1; Merismodes – 1; Metuloidea – 1; Micropeziza – 2; Microstoma – 2; Microthyrium – 2; Moellerodiscus – 1; Mollisia – 35; Mollisina – 1; Monilinia – 7; Morchella – 5; Mucronella – 1; Mutinus – 1; Mycena – 321; Mycenastrum – 1; Mycenella – 4; Mycetinis – 10; Mycoacia – 1; Mycosphaerella – 13; Myriosclerotinia – 5; Myxomphalia – 5; Naeviopsis – 1; Neolentinus – 15; Nidularia – 1; Nimbomollisia – 4; Niptera – 6; Odonticium – 1; Odontotrema – 3; Ombrophila – 2; Omphaliaster – 12; Omphalina – 5; Onnia – 1; Onygena – 1; Ophiocordyceps – 2; Ophiognomonia – 2; Ossicaulis – 12; Otidea – 14; Oxyporus – 2; Pachyella – 1; Panaeolus – 4; Panellus – 4; Panus – 3; Paralepista – 1; Parmelia – 1; Parorbiliopsis – 1; Paxillus – 9; Penicillium – 2; Peniophorella – 3; Perenniporia – 1; Periconia – 2; Pezicula – 3; Peziza – 37; Pezoloma – 4; Phaeogalera – 4; Phaeohelotium – 1; Phaeolepiota – 1; Phaeomarasmius – 3; Phanerochaete – 1; Phellinus – 4; Phellodon – 1; Phellopilus – 1; Phialina – 1; Phlebia – 2; Phlebiella – 3; Pholiota – 86; Pholiotina – 2; Phragmidium – 1; Phyllotopsis – 1; Physalospora – 9; Physarum – 2; Picipes – 5; Piloderma – 5; Pirottaea – 1; Pisolithus – 1; Platismatia – 1; Pleospora – 2; Pleurotus – 33; Plicaria – 2; Plicaturopsis – 2; Pluteus – 201; Polyporus – 14; Porodaedalea – 2; Poronia – 1; Postia – 4; Protomyces – 1; Protoventuria – 3; Psathyrella – 77; Pseudoclitocybe – 5; Pseudohydnum – 2; Pseudombrophila – 1; Pseudoomphalina – 7; Pseudophacidium – 1; Pseudoplectania – 26; Pseudotomentella – 2; Psilachnum – 3; Psilocybe – 39; Pterula – 1; Puccinia – 3; Pycnoporellus – 4; Pyronema – 2; Pyropyxis – 2; Ramaria – 18; Ramariopsis – 12; Resupinatus – 2; Rhizina – 1; Rhizoctonia – 1; Rhodocollybia – 26; Rhodocybe – 1; Rhodofomes – 1; Rhodotarzetta – 2; Rhytisma – 3; Rickenella – 11; Roeslerina – 2; Roridomyces – 5; Royoporus – 2; Rugosomyces – 1; Russula – 253; Rutstroemia – 7; Sarcoleotia – 1; Sarcomyxa – 1; Sarcosoma – 10; Schizophyllum – 3; Scleroderma – 1; Sclerotinia – 1; Scopinella – 2; Scutellinia – 11; Scutomollisia – 2; Setoscypha – 1; Simocybe – 11; Sistotrema – 2; Sistotremastrum – 8; Skeletocutis – 1; Spathularia – 9; Sphaerobolus – 1; Sphagnomphalia – 6; Sphagnurus – 9; Sporomega – 2; Stagonospora – 1; Stamnaria – 5; Steccherinum – 1; Stemonitis – 1; Stereum – 4; Stomiopeltis – 1; Strobilurus – 20; Stropharia – 10; Stypella – 2; Subulicystidium – 1; Suillus – 54; Symphytocarpus – 3; Talaromyces – 1; Taphrina – 1; Tarzetta – 2; Tephrocybe – 8; Thelephora – 9; Tomentella – 2; Trametes – 13; Trechispora – 1; Tremella – 1; Trichaptum – 1; Trichia – 2; Trichodelitschia – 1; Trichoglossum – 1; Tricholoma – 46; Tricholomopsis – 12; Trichophaeopsis – 1; Trichothyrina – 3; Tubaria – 20; Tubulicrinis – 3; Tuckermanopsis – 1; Tylopilus – 3; Tylospora – 1; Typhrasa – 1; Typhula – 3; Unknown – 239; Usnea – 1; Vascellum – 1; Veluticeps – 1; Venturia – 7; Venturiocistella – 1; Verpa – 4; Verticillium – 1; Volvariella – 2; Wentiomyces – 2; Xanthoporus – 1; Xenasmatella – 1; Xeromphalina – 28; Xylaria – 1; Xylodon – 1.